Icicle Suncatchers - Hand made with crystals, seaglass, gemstones and glass. These sparkly crystal icicles make a festive addition to your home. Whether to celebrate yule or Christmas, they love a sunny window and fir trees. They are adorned with semi-precious gemstones, seaglass, crystal and glass beads. With a blue, aqua, white and clear colour palette, the perfect combination to symbolise ice and winter. They are large in size between 6-6.5 inches with gorgeous oversized beads that shimmer and sparkle. Triple Set: Three droplets of differing heights. Beads: Cultured sea glass, rock crystal, agate, quartz and Czech glass. Metal: Solid copper wire with a patina finish polished to reveal the warm coppery tones beneath. The copper has been hand painted with a gloss varnish to retain the glossy highlights. Droplet Heights Approx: 16cm, 16.4cm, 16.75cm / 6.2 inches, 6.4 inches, 6.59 inches. Agate is a translucent microcrystalline quartz and is related to balancing yin yang in the body, protection, strength, courage, calmness and healing. Agate also helps the eyes, uterus and stomach, pancreas and cleanses the lymph system. Quartz helps regulate and balance energy. It helps draw out negative energy, balancing the emotional, physical and spiritual body. It also helps the immune system, aids focus, clarity and helps with memory problems. 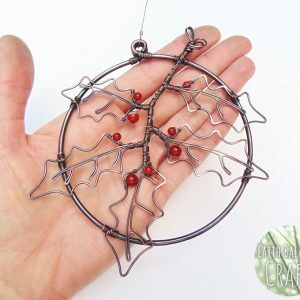 A botanical copper wire-work holly leaf hanging ornament adorned with red berry agate beads. This pretty decoration is inspired by the magical evergreen holly tree, a plant that is steeped in tradition and a familiar sight at yule-time. It is seen as the masculine element, with its’ prickly leaves and ripe fertile red berries. The leaves have been framed with a copper hoop, and can be hung on the wall, in the window and out in the garden for festive colour. It has been designed to be an ‘heirloom piece’, to last for years to come. Take a walk into snow covered woodland, where shimmering icicles are hanging from tree branches. The design features a sanded piece of natural wood that is warm and tactile, with seven beaded droplets of glittering semi-precious gemstones and glass beads. Each droplet is suspended by a swivel barrel which allows the icicle to rotate freely around 360 degrees of movement. Hang this pretty crystal suncatcher in your garden or window to capture sunny sparkles all year round, and enjoy the kinetic quality of this piece as the icicles sway gently playing with light. 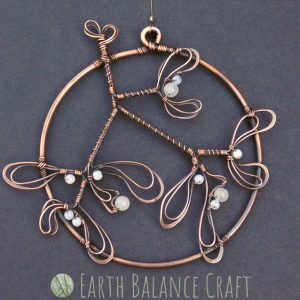 A botanical copper mistletoe leaf and white berry hanging ornament hand-made with agate and glass beads. This pretty decoration is inspired by the sacred mistletoe plant, with white berries and soft curvy leaves that prove beautiful life comes from the earth in winter-time. A familiar sight at Yule, the mistletoe plant is seen as the female element, with gentle feminine power and grace with her twining vines. This festive decoration will last for years to come, a true heirloom piece that is perfect for annual sweet kisses under the magical mistletoe. This pretty woodland inspired hanging decoration features a robin red breast perched on a snowy tree branch in winter time. 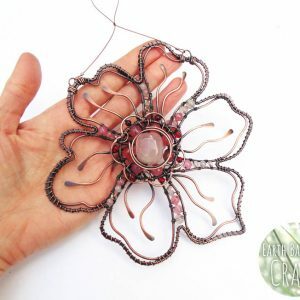 Hand-made with oxidised copper wire work, agate and glass beads, this suncatcher can be hung on your wall, in your window or out in the garden. This design comes from a range of wire art that captures the beauty of British birds. A decorative copper wire butterfly adorned with semi-precious gemstone and glass beads. Inspired by the British ‘Gatekeeper Butterfly’, a beautiful orange species. This piece of wire art is suitable for hanging in the home as a window decoration or in the garden for year round colour. The colour palette is rich with warm oranges, subtle reds and striking translucent lime green set against the contrasting dappled tones of copper. This over-sized pink cherry blossom suncatcher is adorned with rose quartz, pink jade, agate and Czech glass beads. Hand made with oxidised copper wire work that follows those familiar contours of spring blossom. We love seeing nature’s confetti floating through the air as the days begin to warm and the evenings lengthen. The forest bursts into life with pretty pink and white blossom petals. This suncatcher would love to find a sunny window to call home. 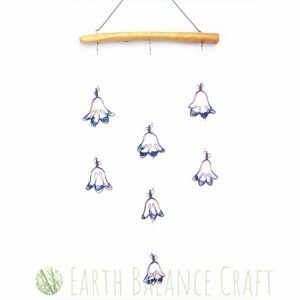 This pretty hanging mobile features spring bluebells adorned with cobalt blue, cornflower blue, lilac and aqua blue colours, spanning the palette of my favourite British wild flower. Inspired by late spring, when all other blossom has faded away leaving the forest floor with a stunning carpet and a sweet aroma, a real celebration for the senses. The top of the mobile is a polished tree branch without its’ bark, that is warm and tactile. Each hanging line has a swivel barrel at the top which gives the flowers free movement as they can rotate around 360 degrees. This rather grand looking British garden bird is the Bullfinch, who is rather fond of spring time flower buds. This copper wire hanging decoration captures the infamous rounded beak of the bullfinch, with his plump red chest, grey blue wings and feathery tail. The design is made with a minimal wire-work feel and can be hung as wall art or as a window decoration. With a swivel barrel at the top that allows the blackbird to rotate 360 degrees freely with movement, as if in flight. This is part of a collection which celebrates the beauty of British birds, with a variety of nature inspired decorations for the home.